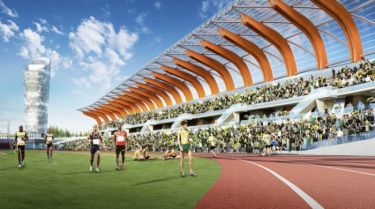 In 2018, the University of Oregon began building a new 12,500 seat stadium to be completed in time for the USA Track and Field Olympic Trials in 2020. The old stadium has been torn down and efforts are being made to reuse materials salvaged form the historic track and field venue. New construction will also include a 4,000 square foot museum. This fast-track project and unusual design called for a quick delivery of large anchor rods. Portland Bolt was selected for our ability to manufacture custom anchor rods quickly. This is due to our combination of large diameter threading and handling equipment along with Portland Bolt operating 2 work shifts per day in order to meet our customer’s needs. In total, we supplied over 90,000 pounds of anchor bolts, with 55,000 pounds shipping in 12 work days to meet their aggressive schedule. 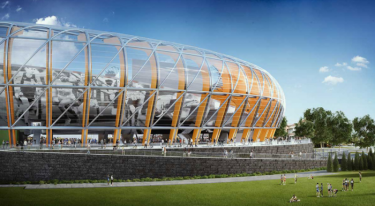 We also provided 15,000 galvanized lag screws which will attach the roof structure to the glulam beams.